Behind the Bit: Riley's rads: Lovely new lamina! Riley's rads: Lovely new lamina! 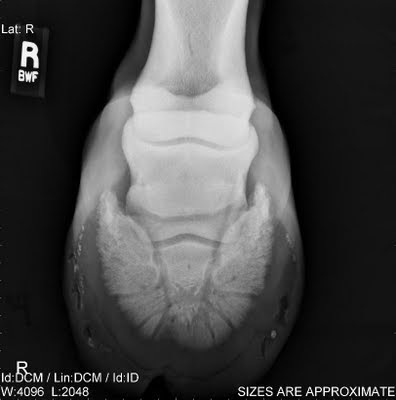 So take a gander at this radiograph of Riley's hoof taken 1/6/10, just prior to trimming/re-shoeing. The surgical defect has almost entirely grown out (compare to mid-September rads if interested). Note that it has grown more "out" than "down" (I didn't know the hoof grew out that way). The trim probably removed most of the remaining defect. Note also the terrible state of his hoof -- no heel, longl toe (again, pre-trim). 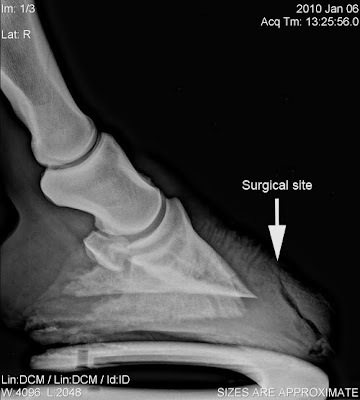 While I'm not sure you can see it in the x-ray, he has lateral cracks in his heels as if someone notched them. Both the vet and the farrier expressed some concern about the crushed heel. I'm hoping some turnout and a normal life should help him regrow the shape God gave him. He was reshod in one Sigafoos glue-on on the surgery'ed hoof, and the non-glue-on version of the same shoe on the left. After this go round, he'll be in normal shoes, probably aluminum. The first post-surgery radiographs showed about 15-20% bone loss -- seeing those radiographs was probably one of the darkest moments of 2009. The radiographs taken 1/6/10 (below) show no further loss, thank goodness. For mysterious reasons, the bone loss worsened following surgery. In case you're wondering, it doesn't grow back. 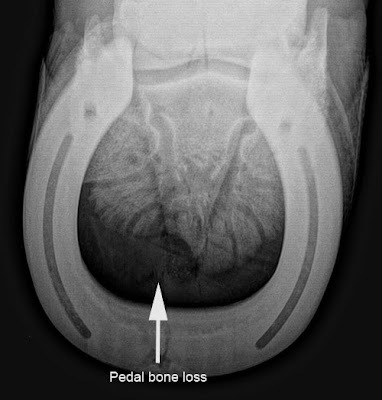 The veterinary texts all say that a horse can lose "up to 25% of the pedal bone" without dire consequences. Riley needs to keep what he's got. He just has to. No Armchair quarterbacking here! You did the right thing at the time it all happened. If I look back at medical decisions I've made, knowing what I know now, I would have done things entirely differently. BUT, at the time, I did the best thing for the current state of research and knowledge. The important thing is that Riley appears to be healing well and should be fine. I send good vibes and postive thoughts. Absolutely agree with Jean. You can't look back, say "what if..." You turned yourself inside out to do the very best for your horse. Maybe if you'd chose another route you be saying today ' ..perhaps I should have gone for surgery". Hugs, Stacey. You did do the best you could, and the truth be known, so did the vets. I understand trying to do the best and looking back and thinking shoulda, coulda, woulda. But as the others, I encourage you to go on. You are a wonderful, responsible horse owner. This is a brighter day. Agreed with all above. The important thing is that he's been improving so much and you're coming into the light now. Don't second guess yourself. You made an informed decision!